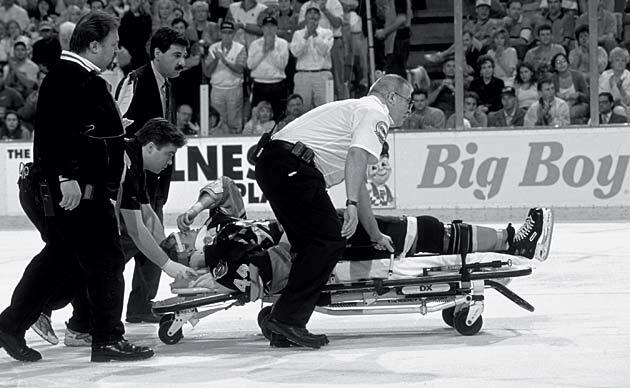 Chris Pronger, member of the Hockey Hall of Fame’s Class of 2015, suffered a painful end to his NHL career: an SI Vault 2013 feature story by Brian Cazeneuve. The Hockey Hall of Fame’s selection of Chris Pronger as a member of the class of 2015 was not without some controversy as he is still technically active though unable to play. This story, about how eighteen months after an eye injury and post-concussion symptoms derailed his storied career, the defenseman faced a tough life away from the game, originally appeared in the April 22, 2013, issue of Sports Illustrated. Subscribe to SI magazine here. Special Championship Offer: Get a Commemorative Chicago Blackhawks book and framed cover. At 38, the Flyers’ former captain is nearly 18 months removed from a severe eye injury and a head injury, suffered in incidents three weeks apart, that drove him into what he calls “a black hole of depression.” Pronger could once command a room with a presence befitting one of the game’s most dominating players. He was uncommonly gifted and menacing, the first defenseman since Bobby Orr to win the Hart Trophy as league MVP. He won two Olympic gold medals with Canada, went to the finals with the Oilers (in 2006) and Philadelphia (in ’10) and won a title in Anaheim (in ’07). Veteran teammates deferred to him, and new ones cowered. “My first day I was intimidated just to meet him,” recalls the Lightning’s Matt Carle, Pronger’s defense partner in Philly from ’09 to ’11. Pronger never hesitated to spar with opponents in the press, and sometimes he took shots at reporters too; he once asked if an opponent who had criticized him was headed to the minors and then checked to see if the writer knew how to spell demotion. He reveled in all forms of combat. He missed six games, then came back for five, insisting he felt fine even though, he says, “I was way off. Dizziness, nausea. I hid it. I didn’t say anything. But in the games you’re leaving yourself exposed to hits, making plays you wouldn’t normally make.” In Pronger’s fourth game back Coyotes forward Martin Hanzal drove him into the boards from behind. “Didn’t look bad,” Pronger recalls, “[but] bells started ringing. I just didn’t answer them.” Two nights later he left the arena in Winnipeg feeling woozy and disoriented. He has not played since. Pronger always delivered more punishment than he received. He would gladly slice into a chiffonade with his stick what his 6' 6", 220-pound frame was unable to mash to a pulp with a bodycheck. “You always knew that when you were in his house, you were going to get poked and knocked around,” says Flyers winger Scott Hartnell, who played against Pronger for eight years until the latter moved to Philadelphia in 2009. “Chris was the best player in the NHL at knowing where you didn’t have padding.” Rival fans rained invective on him. (PRONGER WOULD SPEAR HIS GRANDMOTHER, one sign read.) His wild abandon earned him eight suspensions. Pronger has not officially retired, and both he and Flyers G.M. 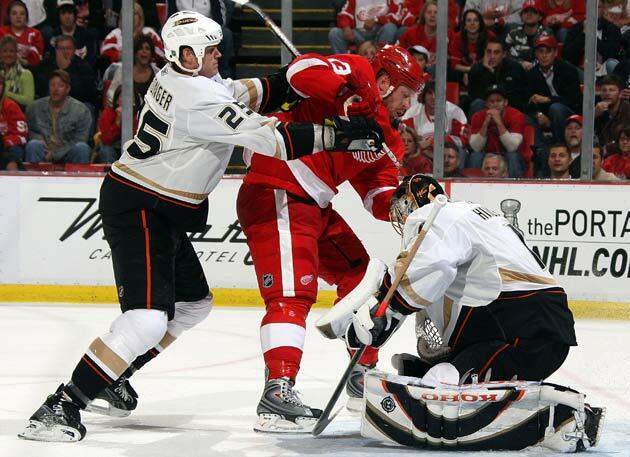 Paul Holmgren use the phrase never say never when describing his prospects for returning to the ice. Their charade seems absurd, but it serves a purpose, since the team can dodge a yearly $4.9 million hit against its salary cap through the end of his contract in 2016-17 if Pronger is out with an injury. The Flyers will likely keep an office or a scouting job open for him, and he raves about Holmgren’s support. Pronger feels that the onus for solving hockey’s concussion problems is not all on the NHL. He wants players to look out for themselves by talking about symptoms and protecting themselves on the ice. “Kids now go a hundred miles an hour, but they have their heads down and expect the referees to protect them,” he says. “If a guy’s coming at you and his head is in front of his body, where are you going to hit him?” Pronger grows animated, jabbing the air with his elbow. His familiar cackle caroms off the walls. Chris Pronger just stuck you a good one.